WINE ON A CRUISE SHIP? 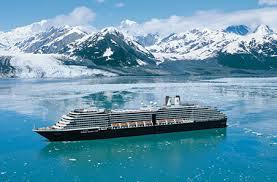 We booked an Alaskan Cruise this September. Dorianne and I are leading a group of twenty – something that we do just about every year; sometimes on land, sometimes at sea. Our 11 night cruise on the Celebrity Solstice departed from Seattle and will end in Vancouver, after exploring Alaska and British Columbia ports of call. We chose Celebrity for a number of reasons. We like their ships (Solstice class especially), and they always do a good job with food and beverages. Celebrity is owned by Royal Caribbean Cruise Lines, and is more upscale than that line. I will be blogging about the wine experience aboard a ship like this, which is positioned between the basic level lines like Carnival and Royal Caribbean, and the upscale lines like Crystal and Seabourne. Celebrity has a wine list of over 60 pages to cover its many dining rooms, buffet areas, cocktail lounges and bars. 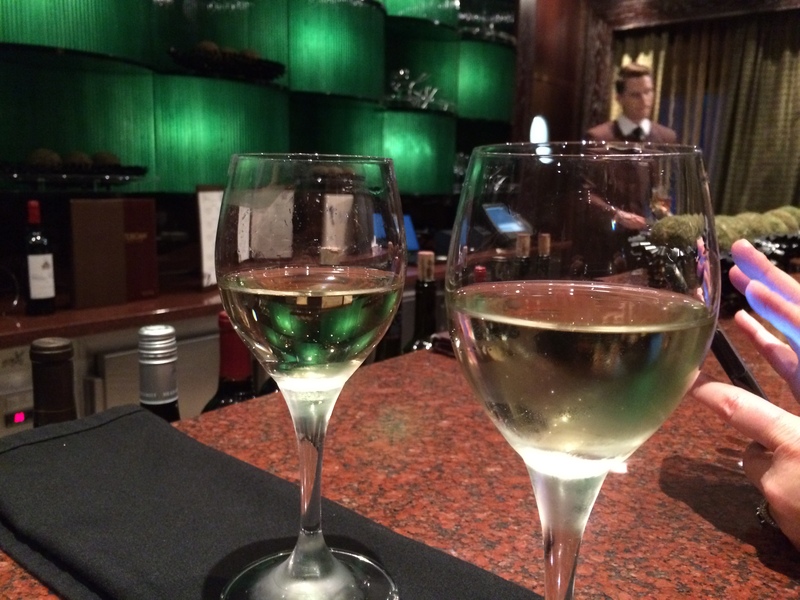 There are a total of 35 to 40 wines served by the glass, the selection varying by location on the ship. Bottled wines are available across a wide spectrum in the main dining room and some of the specialty restaurants; and a more limited selection is available at the other bars throughout the ship. The bars range from upscale lounges with live music to a disco to pool bars to Cellar Masters, which specializes in wine. There are lots of options and very little waiting at any of the bars – the Solstice is brilliantly designed to minimize waits for food and beverages, as well as for just about all activities on board the ship. French Whites at Cellar Masters on the Ship. The first thing to realize is that your wine experience will depend on some of the decisions that you make before you sail. Celebrity offers beverage packages in two basic categories – general packages that include all kinds of beverages; and specialized packages that give access to a narrow range of beverages. You can also opt for a pay-as-you-go process, paying separately for each drink or bottle that you order. There are plusses and minuses to these options, of course. We generally opt for the premium general beverage package. This includes all non-alcoholic beverages, including specialty coffee drinks, premium bottled water, etc., and beer, wine and cocktails up to $13 per glass. The premium package costs $56 per day and must be purchased for the entire cruise. The package gives a 20% discount on bottles of wine. There is also a classic package for $10 less per day that limits you to beverages under $9 per glass. The packages do not cover cabin mini-bar or room service beverages. There is also a wine-only package that gives you a certain number of bottles in one of three price categories for a discount of about 10% off of the regular bottle price. Celebrity’s markups are like restaurant markups – 2 to 2 ½ times the retail price of the wine. With the premium package, you are better off ordering wines by the glass up to the price point of $13 per glass, which covers about 90% of the wines by the glass menu on the ship. There are a few places, such as the specialty restaurants, where you pay a premium to dine, and Cellar Masters, a wine bar, that have a higher number of upscale wines by the glass on their wine lists. BUT, when you order a wine at, say, $18 per glass and you have the premium package, you pay the full $18 for that glass – you get no credit for the first $13, according to Celebrity policy. However, we did speak to a person who said that she had ordered more expensive glasses on this cruise and was only charged for the difference. I will blog separately about the specialty restaurants and Cellar Masters – some very nice wine experiences are to be had there. If you are a wine by the bottle person, you will likely do better with a specialty wine package and perhaps a general package that does not include alcoholic beverages, or a classic general package to allow you to get beer and some cocktails. There are well over a dozen bars on this ship, some with amazing cocktail preparations that may draw you away from a wine-only policy. Plus, you are on vacation – so have fun!